See? There's the variety of opinions! I loved the three piano tracks, as you say, especially since there were none at all on Presence. I'm actually surprised, considering the state of grief Robert was in, that the lyrics weren't darker and more grieving than they were. I already loved LZ III, this new version just doubles it! I do like the simpler ''That's The Way'' for the most part and everything just sounds great. 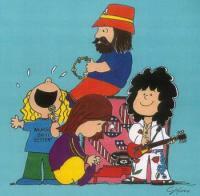 I see how ''Hats Off to (Roy) Harper'' came from ''Key to the Highway,'' very similar style. And it's nice to hear an official ''Jennings Farm Blues.'' Great work, Jimmy! Can't wait for the other six! My reaction to the remastered Led Zeppelin is this: It sounds fantastic, what I've heard so far. I've only heard a couple songs, mainly been playing Led Zeppelin II. I've had to fight the temptation to flip the songs over backward and start the album with ''Your Time is Gonna Come'' instead of "Good Times, Bad Times'' as the cassette album I had and first heard the album as had the sides flipped. Wasn't until some years later I realized the sides were backward and by then I was too used to it! ugh!! lol! I read something about part of the solo sounding scratchy or something and that's why Page edited it. Could it also be, just a guess here, maybe have been part of ''The 59th Street Bridge Song,'' which Page has edited out of any released, live version of "Heartbreaker?" I ordered the albums on Amazon and got digital downloads of the albums for free with them so I'm still waiting on the CD's but enjoying the digital versions. I'm still working through the albums, for LZ II, I say these sound superb, I really love ''La La'' so far. I don't recognize it, is this something different they were working on or did this turn into a released song later on down the line? If it was meant to be a new song, I do wish they could have finished it, cause it is superb. I'm gonna go out on a limb and say this is my favorite new track for Led Zeppelin II. And I do have to say, I have to fight the temptation to flip ''Heartbreaker'' and ''Thank You,'' cause they were reversed on the cassette version of the album and that's how I first heard the album. All the albums, in fact. Didn't early "Immigrant Song" singles have this also? The Original LP Through The Out Door? Or just drip water on it, as a friend of mine found out one time years ago, by accident when some water got splashed on the sleeve and it changed color. I have to admit this is how I first heard of Zeppelin. As I got older and studied this on my own, I don't believe there's any effect whatsoever. I've heard Stairway To Heaven now for almost 21 years and I'm no closer to being a Satanist than when I started. In fact, I'm less so. I don't believe the Devil did it either, because as a Satanism recruitment advertisement, the things the reversals say don't make any sense in that regard. It sounds more like some kind of sad story of someone being deceived by the Devil and something happening which causes insane amounts of suffering. Also, there's a big difference in what really is backward masking, in what people such as ELO and Pink Floyd and Weird Al and other people have done, likely as jokes and then stuff that just appears as speech reversals which is what happens in all instances of supposed "backward masking" in Zeppelin music and there's a lot more examples than just Stairway. I imagine if you could record everything you say all day, there's probably a lot of stuff that could be interpreted by people with good enough imagination to find some kind of backwards statements. There's also been several experiments conducted using Stairway and when the researcher plays the backward segments for people that have never heard of this, they can't decipher anything and it just sounds like reversed gibberish. Then when he says what it's supposed to say, they can pick it up. I think this leads us to perhaps we hear what it "says" because in a way, we've been told what it "says" and therefore perhaps, "programmed" to pick it up? I don't know, that might be too strong a word but it's all I can think of at the moment. In closing, I think it's just a combination of the English language having a lot of syllables that may have multiple meanings when one takes forward and backward direction into account and also a lot of vivid imagination from corrupt politicians and also from Christian preachers, albeit likely with the best of intentions and I didn't criticize them then, nor will I criticize them now for talking about "backward messages in rock music." In my opinion, there is a lot of stupid crap in rock music, I will agree with them on that note. I also believe that these men were simply doing what they felt was the right thing to do. Too bad most of us (and by that I mean people in general, no one specific) don't have those kinds of convictions. But nevertheless, they still jumped on the bandwagon about this way too early and didn't have all the facts available to them when they made their cases to the public. In other words, the stuff means nothing, except for an interesting urban legend and I think it should be left as just that and forgotten about. Zeppelin sounds MUCH better forwards, in any case. Thank you. Looking forward to watching it. Might I suggest actually sending it in to Zeppelin, if there's some way to get it to Page? You never know, there may well be a bootleg from that show and if so, it might get synced up to the right music as has been done with many bootleg records and videos on Zeppelin's YouTube channel. Stairway To Heaven Oddly enough, I had never heard of Led Zeppelin until I heard a tape of a radio show back in the early 80's about backward masking and the accusations of Led Zeppelin being nothing but Satanists and a vehicle for Satan. I heard the backwards clips before I ever got to hear the song all the way straight through. It would be several years later (1988 I believe) that I was listening to a weekly Sunday night dedication show on the radio and Stairway came on. I had a tape ready to tape songs here and there and when I heard it was Stairway, I just hit the tape and recorded the song. I listened to the song finally all the way through and realized how beautiful it was. As I started listening to more and more Zeppelin, I did studies on my own about backward masking and came to the conclusion that the effects of it were exaggerated and besides, Zeppelin's music sounds so much better forward that backward in any case. There's too much positivity and uplifting moments in the Zeppelin catalog and I've been very grateful to be able to have these wonderful songs to listen to. From Stairway To Heaven onward all down the line, this body of work is absolutely amazing. Thank you, John Bonham. Thank you John Paul Jones. Thank you Jimmy Page. Thank you Robert Plant. I don't listen to it a whole heck of a lot these days. It's probably a little bit of the overplaying coming into play here but mainly I think, it's cause there are other songs I'd rather hear right now. I remember an interview with Robert Plant back around 1990 during that Led Zep weekend on MTV and he said it was the variety that kept Zeppelin alive. Usually though when I do play it, it's the live version from BBC Sessions that I play. I guess that's my favorite version. Robert wrote them. If memory serves, and I'm sure there's others who can say for sure, but if I remember right, wasn't "Tangerine" the last Zeppelin song that Page wrote lyrics for? I seem to recall that after reading Plant's lyrics for "Thank You" that Page decided Plant would write the lyrics from then on out with the odd occasional exception. Who would be a good Plant replacement? Nobody. If they couldn't replace John Bonham, they can't replace Robert Plant. Either convince him to tour with the three as Led Zeppelin, or call it something else, cause Zeppelin it ain't. Sorry. I would believe it if it were on a more reputable website than a tabloid newspaper. If it had been Rolling Stone or something then perhaps. But I think, in the final analysis, I'll believe it when Led Zeppelin announces it on the official site. LED ZEPPELIN IS RANKED 3RD ON THE TOP 10 ALL-TIME GREATEST ROCKER PERFORMERS! Being third below The Beatles and Elvis seems appropriate. I like that arrangement. Maybe it was something he conceived of later? What is Robert trying to do? They didn't sound completely like Zeppelin when Plant toured with Page in the 90's till they went down to the four piece band. I heard Joe Bonamassa's version of Tea For One recently on YouTube and after only a minute of it, all I could say was..... WOW!!!! WHAT SONGS SHOULD LED ZEPPELIN PERFORM LIVE IF THEY DO DECIDE TO GO ON A FULL WORLD TOUR? NEW stuff!! Write and record a NEW album first THEN tour! Please, if you do get back together, give us some NEW stuff! How did "Stairway" stack up? I thought it was great. BBC Sessions is my favorite version, but the O2 version is right up there. One thing I like is now with Plant's lower vocal range, I can finally sing along! lol!! I agree wholeheartedly. As much as I'd love to see Zeppelin, I wouldn't want it to just be a recap of their previous career. Get an album done first with all new, fresh material and then go out on tour. If that happens, great! If not, then I'd say that the O2 was a splendid way for the band to re-appear for a good tribute show and indeed, go out on top like they always should have done.